Pycnopodia helianthoides is known as the sunflower sea star, or less frequently referred to as the twenty-rayed sea star  and the many-rayed star. 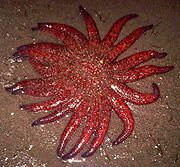 The sunflower sea star's scientific name, Pycnopodia helianthoides, is the literal combination of 'many-' or 'densely-' (pycno) with '-footed' or '-legged' (podia), and 'sunflower-' (helianth) with '-like' (oides), meaning the densely footed sunflower. P. helianthoides was originally named Asterias helianthoides by Brandt in 1835, but in 1862, Stimpson changed the name to what is still in current use. It is one of the largest and fastest moving of sea stars in the world, and is endemic to the Pacific Northwest. The size of the sunflower sea star varies with age; the adults range from approximately 46 cm  to 66 cm , up to as large as 1 m in diameter, sometimes even larger , and with a weight up to 5 kg . P. helianthoides is radially symmetrical and has as many as 24 rays (however, a report of 26 rays has been noted ); juveniles have only 5 rays, growing more as they age. Below 100 meters, Rathbunaster californicus and Pycnopodia helianthoides can appear very similar. Unlike many other sea stars, such as the hard and rigid Pacific sea star (Pisaster ochraceus) which has a heavily calcified skeleton, P. helianthoides has a very soft and flexible body, due mostly to its loosely connected aboral skeletal plates . To the touch, P. helianthoides is very soft and flaccid, with a velvet-like feel to its aboral surface . P. helianthoides is a member of the order Forcipulatida, which all share the following characteristics: the presence of 5 or more rays, have crossed and straight pedicellariae present, and have tube feet arranged in 4 rows . Lambert (2000) defines pedicellariae as “small jawlike structures that occur on the outer surface of sea stars”; pedicellariae are sometimes referred to as tiny pinchers . P. helianthoides' natural range is from Unalaska, Alaska , down to Prince William Sound, Alaska , into the San Diego area of Southern California ; however, P. helianthoides is uncommon south of Carmel Bay in the Monterey area . You can sometimes find P. helianthoides at low tide in sandy substrate in an Eel grass (Zostera sp.) meadow , within tide pools in rocky substrate , and also within surge channels, believed to be used as a means of moving in and out of intertidal areas  . P. helianthoides is considered a low-intertidal organism, with a natural vertical depth range to about 120 meters; P. helianthoides was found as deep as 437 meters on an isolated occasion, seeming to be an anomaly . Pycnopodia helianthoides are dioecious, and breed via broadcast spawning between March and July . The fertilized zygotes develop into free-swimming, pelagic, planktotrophic larvae , and remain in the water column for up to 10 weeks . While in their planktotrophic larval stage, and during the immediate period following their metamorphose into a five rayed juvenile, P. helianthoides feeds on single-celled algae . P. helianthoides appears to prefer purple sea urchins (Strongylocentrotus purpuratus) as a prey source ; S. purpuratus will actively flee from P. helianthoides, as will other mobile prey organisms. P. helianthoides also eats bivalves, barnacles, chitons, snails, polychaetes, crabs, sea cucumbers and some smaller sea stars    . P. helianthoides feeds by both extruding its stomach and digesting its prey externally or it will completely cover its prey and pull it in to its stomach, digesting prey internally . Research suggests that P. helianthoides uses chemosensory perception to scavenge on dead and dying organisms , such as dead squid  and flat fish . When P. helianthoides ingests indigestible material, such as a squid pen or the spines of an urchin, it will extrude the indigestible matter through the aboral surface of its body  . P. helianthoides' few natural predators include the Alaska king crab (Paralithodes camtschaticus)   and the carnivorous morning sun star (Solaster dawsoni)  ; gulls have also been seen attempting to feed on an exposed P. helianthoides within the intertidal zone . When a predator finds and attempts to eat P. helianthoides, it will autotomize its rays as an escape mechanism, commanded by chemicals from injured tissues  . It is not uncommon to find P. helianthoides in the process of regenerating new rays, visible by the presence of significantly shorter rays alongside full length rays  . An single sunflower sea star can have as many as 15,000 tube feet  , allowing it to travel between 96  and 110  meters per hour. P. helianthoides' tube feet are very strong and stretchy; they have strong suckers on the bottom that allow them to cling to rocks in heavy waves. Their tube feet will often break if a person or a predator succeeds at pulling the star off of it's substrate  . Interspecific competition for food has been observed between P. helianthoides with both Pisaster brevispinus and P. giganteus; intraspecific competition between individuals for space has also been reported . Video of P. helianthoides attempting to feed on abalone. Video depicting P. helianthoides' appetite, and prey escape response. Boolootian RA. 1966. Physiology of Echinodermata. Interscience Publishers. Shivji M, Parker D, Hartwick B, Smith J and Sloan NA. 1983. Feeding and distribution study of the sunflower sea star Pycnopodia helianthoides. Pacific Science. Volume 37. Kjerskog-Agersborg HP. 1918. Bilateral tendencies and habits in the twenty-rayed starfish Pycnopodia helianthoides. Biological Bulletin. 35: 232-254. ↑ 1.0 1.1 1.2 1.3 1.4 1.5 1.6 Sept JD. 1999. The Beachcomber’s Guide to Seashore Life in the Pacific Northwest. Harbour Publishing. ↑ 2.0 2.1 2.2 2.3 2.4 2.5 2.6 Morris RH, Abbott DP, and Haderlie EC. 1980. Intertidal Invertebrates of California. Stanford University Press. ↑ 3.0 3.1 3.2 Lamb A and Hanby BP. 2005. Marine Life of the Pacific Northwest. Harbour Publishing. ↑ 4.0 4.1 4.2 4.3 Harbo RM. 1999. Whelks to Whales. Harbour Publishing. ↑ 5.00 5.01 5.02 5.03 5.04 5.05 5.06 5.07 5.08 5.09 5.10 5.11 5.12 5.13 5.14 5.15 5.16 5.17 5.18 Lambert P. 2000. Seas Stars of British Columbia, Southeast Alaska and Puget Sound. UBC Press in collaboration with the Royal British Columbia Museum. ↑ 6.0 6.1 6.2 6.3 Carlton JT. 2007. The Light and Smith Manual: Intertidal Invertebrates from Central California to Oregon. University of California Press. ↑ 7.0 7.1 Meinkoth NA. 1981. The Audubon Society: Field Guide to North American Seashore Creatures. Alfred A. Knopf, Inc.
↑ 9.0 9.1 9.2 9.3 Ricketts EF, Calvin J and Hedgpeth JW. 1985. Between Pacific Tides. Stanford University Press. ↑ 10.0 10.1 10.2 10.3 Niesen TM. 1997. Beachcomber’s Guide to Marine Life of the Pacific Northwest. Gulf Publishing Company. ↑ Brewer and Konar. 2005. Chemosensory responses and foraging behavior of the seastar Pycnopodia helianthoides. Marine Biology. 147: 789-795. ↑ Mladenov PV, Igdoura S, Asotra S and Burke RD. 1989. Purification and Partial Characterization of an Autotomy-Promoting Factor from the Sea Star Pycnopodia helianthoides. Biological Bulletin. 176: 169-175. ↑ Wobber DR. 1975. Agonism in Asteroids. Biological Bulletin. 148: 483-496. This page was last modified on 4 March 2011, at 18:56.